58: That is the number of international caps between Kieran Marmion and his opposite number on Saturday, Aaron Smith. Marmion revealed he looked up to the All Blacks half-back in the build-up to the game. 36: That is the number of kilos that Kieran Read is heavier than Marmion, but it didn't stop the Connacht man lining him up with a big on-the-ball tackle, stopping him dead and grounding him with the help of Josh van der Flier in the 50th minute. 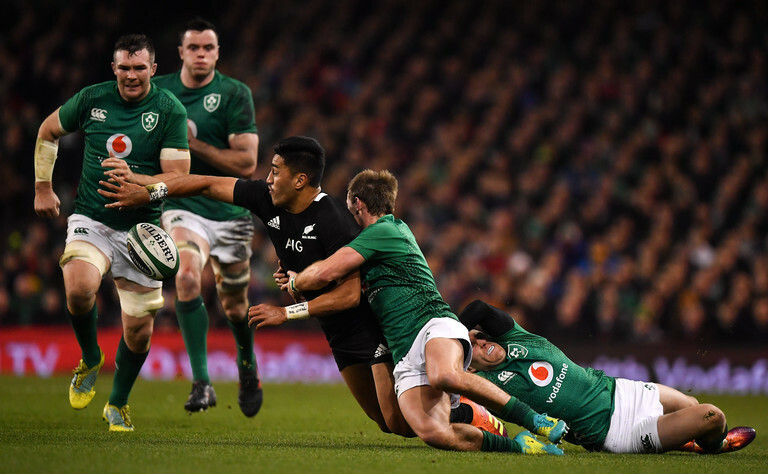 Leaving aside the subjective, impulsive and general frivolousness nature of the player rating process, there is no doubt that Marmion's input to Ireland's historic victory against New Zealand on Saturday will dim in comparison to the herculean efforts of players like Peter O'Mahony and Devin Toner. Yet he was a vital influence and deserving of the plaudits that Joe Schmidt singled him out for post-match. "What I was really proud of, Kieran Marmion and Luke McGrath, what a massive test for them!" Marmion's defensive prowess is an aspect of his game that Connacht fans will be keenly aware of. One of the defining moments of their extraordinary Pro12 triumph was a narrow victory over the Ospreys in February 2016. Connacht were five points up with the clock winding down when Welsh out-half Sam Davies pierced the line and look destined to touch down in the corner. He was brought to ground by a last-gasp covering tackle from Marmion and had his try ruled out for a double-movement. Kieran Marmion won the head-to-head battle against Aaron Smith and vindicated Schmidt's trust in him to fill Conor Murray's sizeable void. His box-kicking drastically improved after a shaky start but it was his contribution on the other side of the ball that deserves most praise. His defensive ability was something Joe Schmidt actually highlighted prior to the game, as reported by the Irish Mirror: "He’ll slot in, he’ll plug the front defensive line, he’ll work his way across the pitch looking to make sure that he’s got anything in behind covered as well." He did that and more. This Ireland team trust in their Andy Farrell crafted defence. There is no real desire to play rugby within their own '10 so they generally kick deep and back their own ability to regain possession by forcing a turnover. Farrell opts for a 14-1 defensive line, relying on quick line speed and suffocating pressure to keep rival attacking units at bay. Thus, there can be no passengers, not even at scrum-half so Marmion must contribute defensively. The 26-year-old finished with 8 tackles, more than five of his starting team-mates. 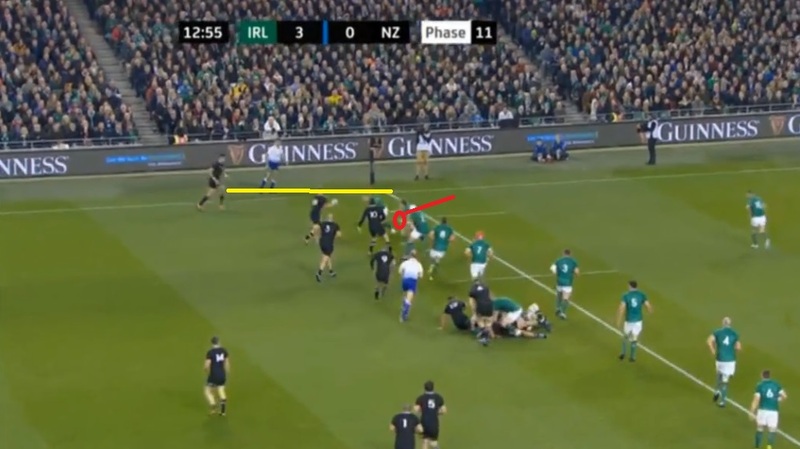 This included a technically poor but effective covering tackle at 13 minutes after Rieko Ioane had gotten outside of Keith Earls. 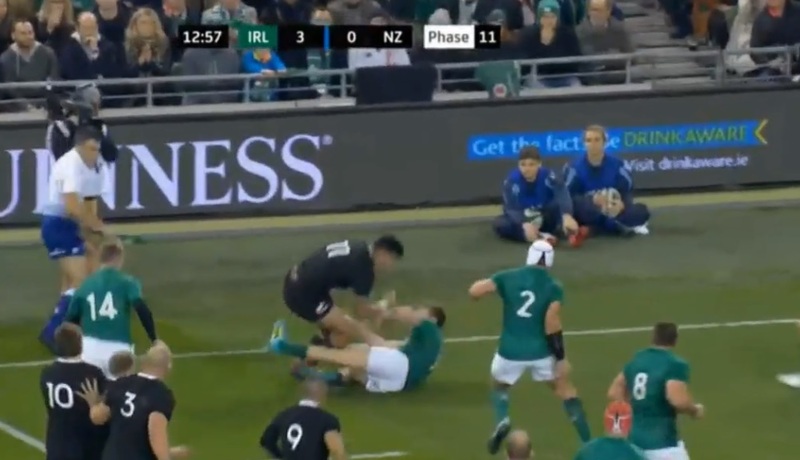 New Zealand were forced to come back across the pitch and a phase later Devin Toner forced a knock-on with a big hit on Brodie Retallick. Later in the game, Marmion came up trumps again with a potentially try-saving tackle. Dane Coles fired his line-out over the six-man set-piece and into the path of Ioane. The lightning-quick winger tore past Rory Best and CJ Stander. Marmion was left with a huge amount of ground to cover but raced back in typical style to combine with Earls in the second layer scramble and force a knock-on. 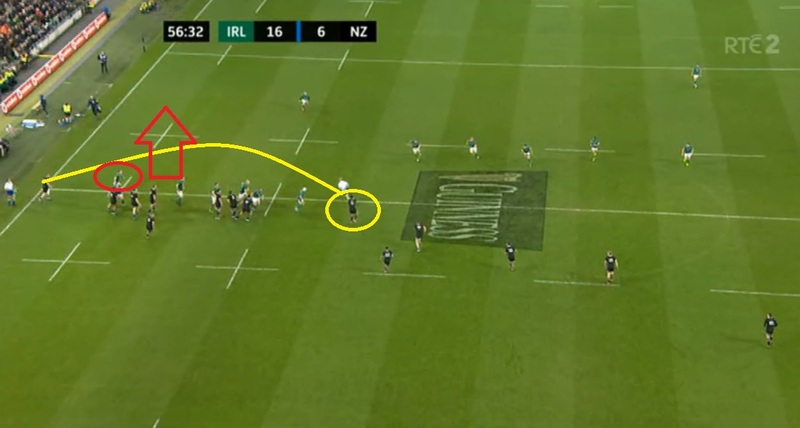 Kieran Marmion had some big moments for Ireland last night. He took that chance. Kieran Marmion did not just survive his biggest test in a green shirt, he thrived.